Zombies on the prowl for “braaaains” could do much worse than Jane Austen’s witty and forward-thinking novel Pride And Prejudice. By combining one of the literary world’s favorite books with the horror staple, author Seth Grahame-Smith captured the zeitgeist of 2009, and a film deal quickly followed. Of course, the adaptation has spent the years since slowly shuffling from director to director, refusing to die. But 2016 is a new dawn (of the dead), and the film is finally ready to see the light of day with a cast including Cinderella’s Lily James, Doctor Who’s Matt Smith, and a Game Of Thrones two-fer in Lena Headey and Charles Dance. 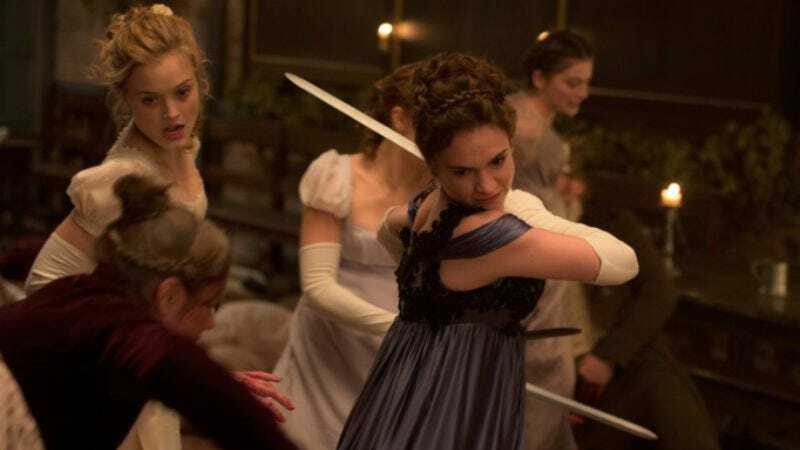 Pride And Prejudice And Zombies opens nationwide on February 5, but The A.V. Club and Screen Gems have an opportunity for you to see it for free on February 2. For your chance to win a pair of passes to the advance screening, simply follow the link here and enter your information. Remember: Advance screenings are often intentionally overbooked, so be sure to arrive early if you want to guarantee yourself a seat. An official plot synopsis and trailer for the film can be found below.